I assume it is quite obvious this article is about Windows 8, starting with a general overview about some great enhancements in the Operating System, moving over to some important reasons I think why businesses should migrate to this newest version, followed by some key features and new functionalities. But hey, what does the “XP” refer to? Well, based on publicly available figures and facts, 60% of all business worldwide are still using Windows XP as the main operating system in their environment. To my opinion, Microsoft biggest weakness and concern in having organizations migrate massively to Windows 8 is the quality of its predecessor, Windows XP. Also in my opinion – and I’ve been playing and working on my production laptop with Windows 8 since the first beta came out September 2011 – companies will migrate to Windows 8 anyhow, but it will be a long way. When I was a system engineer during the XP era, I remember how difficult organizations migrated from their stable and trusted Windows NT workstations. Now that Windows 8 is available, I have this “back to the future” feeling. I truly hope I’m totally wrong here, but there are some reasons to be actually quite sure about this. Times have changed, end-users have changed, IT demands and usage have changed… We no longer think about our “workstation” as a monolithic device under our desk at the office with a 15 kg-weighting monitor on top of it. Neither is our “mobile workstation” the not-so-mobile laptop we know from the past. Today, we have cool-looking user-friendly laptops, notebooks, ultrabooks, and tablets, and that is what people want to work with. The main issue with these cooler devices is they are not always capable of running our required business applications. And that is where Windows 8 will change the market: As it is Windows, it is capable of running our (Windows 7 legacy) Windows applications. On top of that, it has a slick interface, is touch enabled by design, and since it uses the Microsoft Store, we have a plethora of Apps. Even a lot of well-known software developers already have delivered a “Windows 8 App” version of the same software; the same functionalities, in a touch-friendly, better looking way. Moving on, let’s continue with some of my own experiences and key enhancements of Windows 8. One of the biggest changes when you start using Windows 8, is the fact the familiar Start button (which was there since Windows 95!) is completely removed. In return we get a whole new Start Screen. And by screen I really mean screen. The more apps you install (legacy or Windows 8 Apps), the more you have to scroll through from left to right. But you can also swipe — and you can also use keyboard input. Yes, just like we were used to type in “start / run / winword” to open up Microsoft Word (for example), I can now begin typing “word” in the Start Screen, and it will give me all references to “word” in an application name, file name, or setting. Same applies to control panel, system, display settings, and network settings. At first sight, it seems all to have disappeared, but if you get your way around in Windows 8, you will find out it is all there — it’s just “under the hood” of the nice-looking Windows interface (which used to be called Metro interface). I could continue more on the interface itself, but that is not the biggest change in Windows 8. So let me continue with some other really cool experiences. Okay, I have to admit, that subtitle comes directly from Microsoft’s marketing division. What it means is that Windows 8 leverages all user handling aspects of your device. Yes, it can run on a desktop (if it says Windows 7 capable, it is also compatible with Windows 8), it will also work perfectly on our existing laptops, notebooks, and ultrabooks. But the best experience is yet to come — when device builders start deploying the best, coolest, and fastest multi-touch capable and multi-function capable Windows 8 device. Over the past few weeks, a lot of specific Windows 8 devices were announced and some of them are already available on the market. What looks like a regular notebook seems to be a mixed device of notebook and touch-screen. 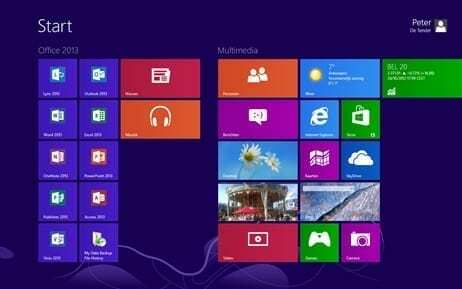 Windows 8 is designed to run on a plethora of device types and form factors. As already mentioned during my introduction, a lot of the way how Windows 8 will be received is depending on the Microsoft App Store. Because, after all, what is a good operating system without applications, right? The Microsoft App Store is a cloud service. You connect to the Store, select the applications you want (free and payable), double-click to install them, and that’s it. For companies, the same principle exists if they are using Windows 8 Enterprise Edition for deploying their line-of-business apps with control, by using side-loading. (I’ll explain more on side-loading in the next few articles). Another cool feature related to this “always connected-ness” is automatic wi-fi network detection, automatic installation of home network trusted devices like your printer, and NAS-storage with all your home videos and multimedia files. Going back to the enterprise world, Windows 8 comes with intelligence on bandwidth metering. This means it is capable of detecting if you are connected through a high speed LAN, wi-fi, or (slow) 3G connection. By detecting this, it then knows not to install the latest 250 Mb application download when connected using 3G. How smart is that? Without going to much in detail (as this is easier to describe from a more technical article), Microsoft set the security bar really high during the Windows 8 development cycle. It is the most secure operating system ever delivered from Microsoft. Some additional features to support this expression are Secure Boot, which protects the boot sector from being hijacked; Bitlocker 2.0, an upgraded version of the disk encryption system that was first initiated in Windows Vista; Bitlocker to Go, a disk encryption on portable media like memory sticks or USB devices; Windows Defender, a built in antimalware solution; and Internet Explorer 10, the most secure browser available on the market. 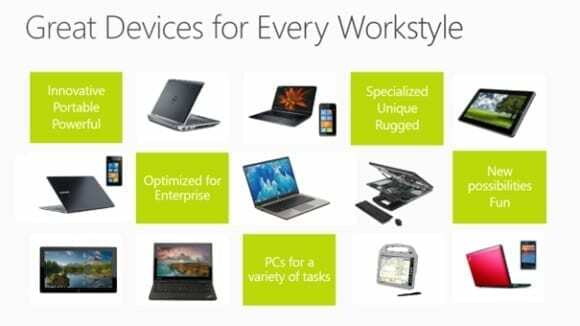 One of the coolest business features within the Windows 8 Enterprise will be Windows To Go. This is a mechanism that allows you to create a bootable, fully operational Windows 8 environment on an USB drive. This will help businesses in situations like having external consultants (or even employees) coming over with their own devices (BYOD – Bring Your Own Device anyone? ), and giving them a secure company-managed Windows 8 environment that is controlled by the company IT department. No more worrying about non-secured devices entering your network. Other examples where Windows To Go can be handy is kiosk PCs and classroom devices. One of the last technology features I will mention here is Client Virtualization. Better said, Microsoft Hyper-V virtualization, that existed since Windows Server 2008, but now directly from your Windows 8 client. This will be a life-saver for developers, IT pros, trainers, and speakers, as they can now run a full virtual machine environment from their own device (taking memory and CPU requirements into account, of course). By now I hope I have warmed up your interest for the latest and greatest Microsoft Operationg System — that being Windows 8. In the next couple of articles, I will dive more into the technical details of some of these features, as well as explaining more in detail how business can migrate from their existing client platforms (XP, Vista, and Windows 7) to Windows 8. As an IT professional with over 15 years of experience, I have a strong focus on Microsoft technologies, with an expertise in Exchange Server and Forefront TMG. Besides those, I work frequently on general Microsoft Core IO platform integration and consultancy projects as an Infrastructure Architect. I’ve been teaching several Microsoft Official Courses for the last 6 years – of which the last 3 as MCT, and became country lead for the Belgian Chapter of MCT Europe (http://www.mcteurope.com) in Feb 2011. I’m a regular speaker at Microsoft technology related events including local User Group activities, TechDays, MCT Summit Stockholm 2011, MCT Summit NA – San Francisco 2011 and more. Since 2009, I’m also the managing partner of ICTinus (http://www.ictinus.be), a Belgian IT company with a strong focus on Microsoft infrastructure technologies. I’m happily married to my lovely wife Els Lowie, and proud father of my 2 lovely girls Kaylee & Kitana. Without those 3, none of my work, passion and what I’ve achieved so far would ever have been possible.